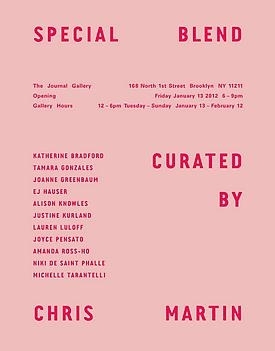 Katherine Bradford, Tamara Gonzales, Joanne Greenbaum EJ Hauser, Alison Knowles, Justine Kurland, Lauren Luloff, Joyce Pensato, Amanda Ross-Ho, Niki de Saint Phalle, Michelle Tarantelli The Journal Gallery is delighted to present "Special Blend," curated by Chris Martin. Some of these artists are old friends. Some of them have never met. This show is a way for them to meet and for their work to converse. Presented as a melange, this exhibition has an earthy flavor with a clean finish. Balanced and light-bodied, it combines honey sweetness with a hint of citrus for a smooth-looking exhibition—perfect for viewing all day.